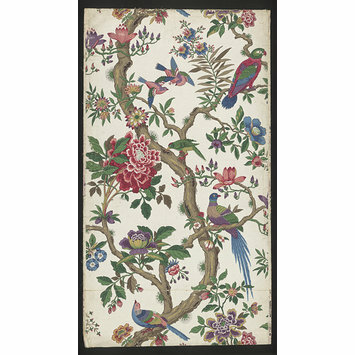 Portion of of 'Chinese Magpie' wallpaper, magpies perched in branches with blossom flowers; Colour machine print, on paper. 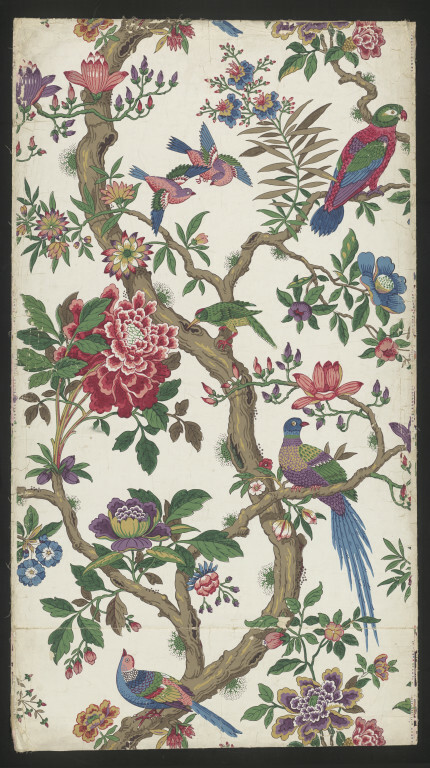 The Chinese paper on which this design is based is E.3679-1913. The annotations in French on the back of the design suggest that it may also have been used by a French firm as a colour guide in making replicas of the paper. Portion of of 'Chinese Magpie' wallpaper, magpies perched in branches with blossom flowers; Colour machine print, on paper; Designed by William Turner (? ); Produced by Jeffrey & Co.; England; 1913.